ELLIPTICAL TRAMMEL is also called as Trammel of Archimedes , Do Nothing Machine, ellipsograph. A trammel of Archimedes is a mechanism that generates the shape of an ellipse. It consists of two shuttles which are confined (“trammelled”) to perpendicular channels or rails, and a rod which is attached to the shuttles by pivots at fixed positions along the rod. As the shuttles move back and forth, each along its channel, the end of the rod moves in an elliptical path. The semi-axes a and b of the ellipse have lengths equal to the distances from the end of the rod to each of the two pivots. 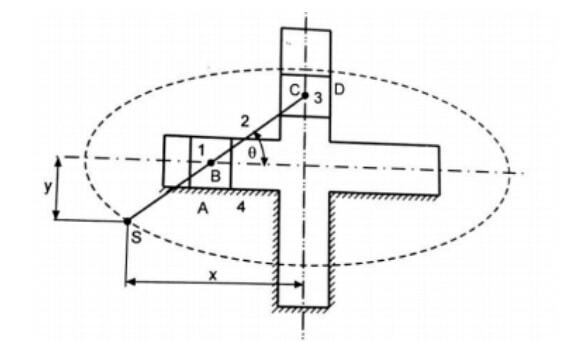 An ellipsograph is a trammel of Archimedes intended to draw, cut, or machine ellipses, e.g. in wood or other sheet materials. An ellipsograph has the appropriate instrument (pencil, knife, router, etc.) attached to the rod. Usually the distances a and b are adjustable, so that the size and shape of the ellipse can be varied. The history of such ellipsographs is not certain, but they are believed to date back to Proclus and perhaps even to the time of Archimedes. Wooden versions of the trammel of Archimedes have been produced also as toys or novelty items, and sold under the name of Kentucky do-nothings, nothing grinders or do nothing machines. In these toys the drafting instrument is replaced by a crank handle, and the position of the sliding shuttles is usually fixed. Since Elliptical trammel consist of two turning pairs and two sliding pairs, it is inversion of double slider crank chain. This instrument is used for drawing ellipses. This inversion is obtained by fixing a slotted plate (link 4) as shown in fig. It has got two right angled grooves cut into it. 1-2 is turning pair 2-3 is turning pair 1-4 is sliding pair 3-4 is sliding pair. It is used in automatic tool changer in a machining. Elliptical Trammels are used for drawing large ellipses. They can be used to draw smaller ellipses but only draw one half at a time, having to be reversed to draw the complete ellipse.